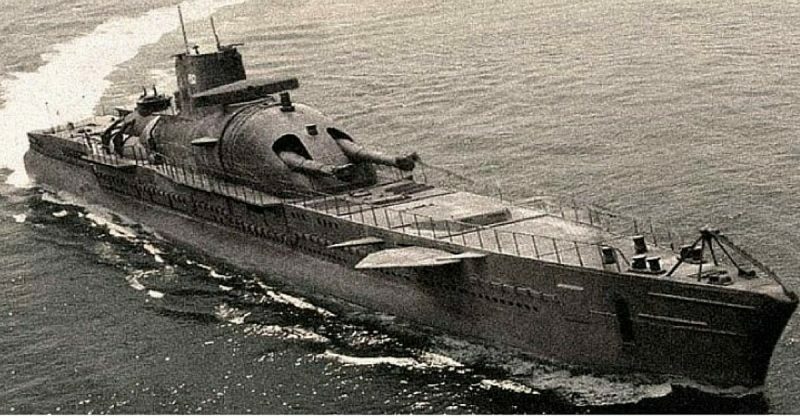 What Happened To the French Undersea Cruiser Surcouf? Bermuda Triangle, Sunk by Friendly Fire or Rammed? The mystery of how the record breaking French submarine Surcouf sunk has been debated since the day it disappeared in the Pacific, near Tahiti. Was her and the 130-strong crew blitzed out of existence by the enemy or was something more sinister at play? Perhaps the sinking of the undersea cruiser just a terrible, terrible accident? Whatever actually took place, it was a strangely fitting end to a ship that had been plagued with problems from the very start of her life until the end. Surcouf was built after the end of the First World War and was launched on the 18th of October, 1929. It was the largest submarine ever built right up until the Japanese produced the I-400-class subs and she was named after Robert Surcouf, who made a fortune by sailing the Indian Ocean as a privateer and merchant. The submarine was intended to be part of the trio of boats and was given the pennant number N N 3 – although the remaining two were never built and Surcouf served her time as an experimental cruiser submarine. Surcouf was built to act as an underwater cruiser and was meant to seek and combat surface ships. In order to carry out reconnaissance, she was equipped with a Besson MB.411 floatplane in a hangar that was specially built near the conning tower. For combat purposes, she was equipped with 10 torpedo tubes. Six of them were 550mm (22 in) in diameter and four of them were 400mm (16 in). She also had two 203mm (8in) guns in a turret placed forward of the conning tower. The 203mm was a medium naval gun that the French Navy employed and was characteristic of cruisers built because of the limitations of armaments imposed by the Washington Naval Treaty of 1922. The 8in guns were controlled by a director who had a 5m (16ft) rangefinder that was mounted high enough to see an 11km (6.8mi) horizon. These guns were able to fire within three minutes of surfacing and if periscopes were deployed to direct fire the range to be increased to 16km (9.9mi). As part of the original design a platform was supposed to lift a lookout 15m (49ft) into the air, but this was quickly abandoned because of the effect it would have on roll. Another way units manning the submarine could direct fire was through the Besson observation plan, which could identify targets up to the gun’s maximum range of 39km (24mi). For defence, there were machine guns and anti-aircraft cannon mounted on the top of the hanger – and for self-preservation a 4.5m (14ft 9 in) motorboat. Included with the equipment was a cargo compartment that could also hold 40 prisoners. The fuel tanks of the craft were also large and could contain enough fuel for a 19,000km (12,000mi) trip and had enough supplies to last the crew of 118 for 90 days. But despite all these impressive numbers, the Surcouf run into a number of difficulties from very early on in the ship’s life. The trim was tricky to adjust during a dive and on the surface the submarine rolled badly in choppy water. She also took two minutes to dive down just 12m (39ft), which had the cruiser vulnerable to aircraft. Along with the technical problems, the history of the ship is also murky. In 1940 the ship was based in Cherbourg, but was being refitted in Brest when the Germans invaded France.